"Your choice of glass is probably the most important decision you will make as a kilnformer." -Artist Steve Immerman on why he exclusively uses Bullseye. Bullseye glass is developed by artists, for artists. We've got your back! 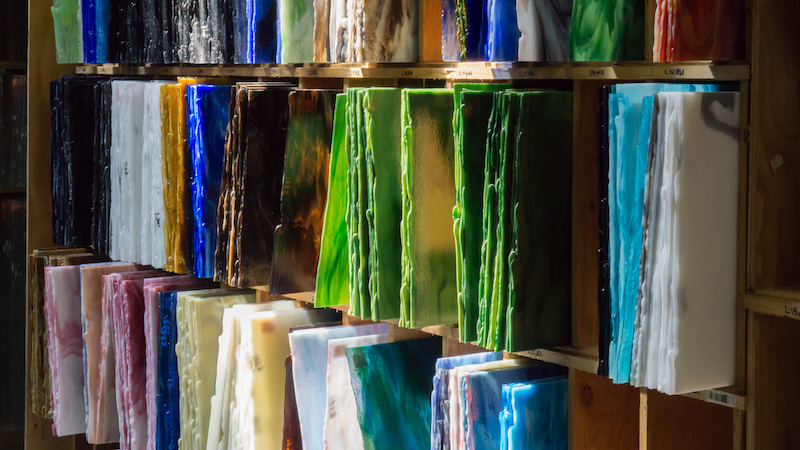 40 years of continuing research on glass formulation makes Bullseye glass ideal for kilncasting, torchworking, kilnforming, fusing, slumping and stained glass. Bullseye delivers more colors than anyone, in a palette designed to meet your needs. The possibilities are almost limitless: use Bullseye colors as they're made, or layer them to create thousands of additional colors. Nearly every Bullseye color is available in both 3 mm sheets and Thin 2 mm sheets. Plus we offer iridescent coatings in both 3mm and 2 mm transparent colors. We also offer frit in nearly every color, and stringer in many colors. Bullseye glass is tested to perform reliably through three firings. Bullseye glass can be pushed well beyond its stated temperature range with minimal problems. The texture of Bullseye glass helps in reducing trapped air between layers. The result: Fewer and more attractive bubbles when firing two or more layers. Consistent thickness from edge to edge. Fusing is all about volume control, and sheet glass that varies in thickness can cause problems. Bullseye's technical support is unrivaled. This includes dozens of free online articles on technique and projects, more than 100 online video lessons (some free, some by subscription), and full-time staff technicians to address any questions via the Bullseye Forum. Bullseye Glass is made only in Portland, Oregon, with a more extensive emission control system than any other glass factory in North America. We comply with all federal and state safety regulations for the protection of our workers and our community. Ready to get started with Bullseye? Signup for our newsletter for product information and project ideas, and to hear about sales and special events in your area.